The Bipartisan Policy Center (BPC) released a report earlier this week on the economic and fiscal effects of immigration reform. By my account, it’s the 10th study this year on the topic. But while each report covers similar ground, they differ in scope and methodology, and so reach different conclusions. Even when studies find that immigration is a win for the economy, the particulars of the findings differ. To bring clarity to the debate, my Urban Institute colleagues and I assessed six studies that we think are important for the current immigration debate. Our goal was to pause and take stock of these studies’ methods, critical assumptions, and strengths and limitations—and then create a guide to help readers evaluate what’s being said. Our upcoming report “Understanding the Fiscal and Economic Impacts of Immigration: A Guide to Current Studies and Future Extensions” lays out a framework we’ve developed for assessing current and future studies. The Bipartisan Policy Center’s report came out too late to be included in our guide, but the questions we ask of all the studies can still be applied. In general, BPC’s study stacks up well against the reports we analyzed, and does better than most. For instance, we argue in our guide that studies should assess how well their results hold up under different scenarios, such as how impacts differ if we assume a different wage growth rate for the legalized population. The BPC study does a good job on this count, providing readers with different wage growth assumptions. We also suggest that studies clearly state their underlying assumptions, such as labor force growth and wage increases, and model what would happen without reform. The BPC also does that well. In our guide, we also point out that it is important to simulate different immigration policies. BPC highlights five different scenarios in its report. However, BPC’s report does not describe nor justify its modeling approach, making it difficult for the reader to figure out from where the findings come from. That said, the BPC study is methodologically stronger than prior studies on this topic. 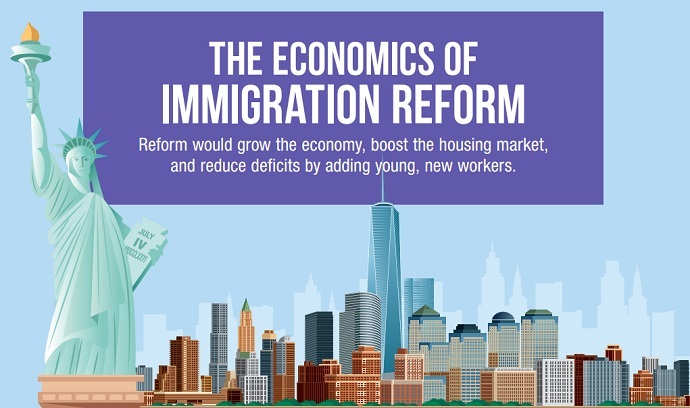 Our guide also suggests ways to expand studies of immigration reform’s economic and fiscal impacts. BPC studies effects on the housing market, which is a new addition to analysis on this topic. However, there is still room to answer questions that are innate to this debate. For instance, we do not know enough about state and local fiscal impacts. And we don’t know how the effects of immigration reform will be distributed: who will be the winners and losers? How will current U.S. workers benefit? Per capita GDP figures are not presented, so we do not know how the wellbeing of the average resident is improved by immigration. Also, we still lack information about the fiscal and economic impacts of legalization, the most controversial aspect of immigration reform. I hope future work in this area can expand our understanding of these and other effects of immigration reform.